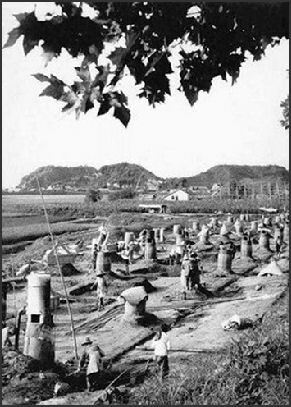 backyard furnaces In 1958 Mao inaugurated the Great Leap Forward, a disastrous attempt to rapidly industrialize, collectivize agriculture on an enormous scale and develop China though the construction of massive earthworks and irrigation projects. As part of the "walking on two legs" initiative," Mao believed that "revolutionary zeal and cooperative effort would transform the Chinese landscape into a productive paradise." The same idea would be resurrected later by the Khmer Rouge in Cambodia. One of Mao's goals during the Great Leap Forward was for China to surpass Britain in steel production in less than five years. Some scholars claim Mao was inspired by the factories he saw in the Soviet Union, and the Great Leap Forward was an attempt by Mao to overtake the Soviet Union so that he could establish himself as leader of the world Communist movement. Mao hoped to achieve this by redistributed labor from large industrial complexes to small backyard factories modeled after 8th century smelters, where peasants could melt down their cooking pots to make high-grade steel. Mao's followers were expected to chant, "Long live the people's communes!" and "Strive to complete and surpass the production responsibility of 12 million tons of steel!" During the Great Leap Forward, farmers were encouraged to make steel instead of grow crops, peasants were forced onto unproductive communes and grain was exported at the time people were starving. Millions of pots and pans and tools was turned into useless slag. Entire mountainsides were denuded to provide wood for the smelters. Villager stripped remaining forests for food and ate most of China’s birds. 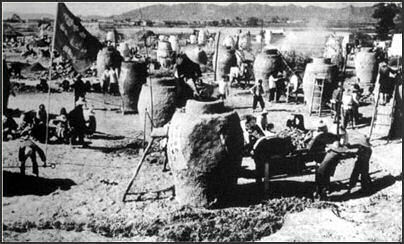 People went hungry because they had melted down their agricultural tools and spent time in the backyard smelters rather than in the fields tending their crops. Crop yields also declined because Mao ordered farmers to grow crops using the dubious practices of close planting and deep plowing. Books: Mao's Great Famine: The History of China's Most Devastating Catastrophe, 1958-62 (Walker & Co, 2010) by Frank Dikotter is an excellent book. Tombstone by Yang Jisheng, a Xinhua reporter and Communist party member, is the first proper history of the Great Leap Forward and the famine of 1959 and 1961. Life and Death Are Wearing me Out by Mo Yan (Arcade,2008) is narrated by a series of animals that witnessed the Land Reform Movement and Great Leap Forward. The Tragedy of Liberation: A History of the Chinese Revolution, 1945-1957" by Frank Dikotter described the Anti-Rightist period. China Witness, Voices from a Silent Generation by Xinran (Pantheon Books, 2009) is collection of oral histories from Chinese who survived the Mao period. Mao; the Untold Story by Jung Chang and Jon Halliday (Knopf. 2005). Jung Chang, author of Wild Swans, and her husband John Halliday, a British historian, portrays Mao as villain on the level of Hitler and Stalin. The book was read by U.S. President George Bush and embraced by the American right as a condemnation of Communism. It characterizes Mao as cruel, materialistic, self-centered and a leader who used terror with the aim of ruling the world. There is also a Mao biography by Jonathon Spence. Also check out: Mao's New World: Political Culture in the Early People's Republic by Chang-tai Hung (Cornell University Press, 2011) and The Private Life of Chairman Mao by Dr. Li Zhisui (1994). Other books: The Penguin History of Modern China by Jonathan Fenby 3) . Red Star Over China by Edgar Snow; 4) China: A New History by John K. Fairbank; 5) In Search of Modern China by Jonathan D. Spence; 6) Cambridge History of China multiple volumes (Cambridge University Press). You can help this site a little by ordering your Amazon books through this link: Amazon.com. "At least 45 million people died unnecessarily between 1958 and 1962. The term 'famine', or even 'Great Famine', is often used to describe these four to five years of the Maoist era, but the term fails to capture the many ways in which people died under radical collectivization. The blithe use of the term 'famine' also lends support to the widespread view that these deaths were the unintended consequence of half-baked and poorly executed economic programs. Mass killings are not usually associated with Mao and the Great Leap Forward, and China continues to benefit from a more favourable comparison with the devastation usually associated with Cambodia or the Soviet Union. But as the fresh evidence ... demonstrates, coercion, terror and systematic violence were the foundation of the Great Leap Forward. "Thanks to the often meticulous reports compiled by the party itself, we can infer that between 1958 and 1962 by a rough approximation 6 to 8 per cent of the victims were tortured to death or summarily killed - amounting to at least 2.5 million people. Other victims were deliberately deprived of food and starved to death. Many more vanished because they were too old, weak or sick to work - and hence unable to earn their keep. People were killed selectively because they were rich, because they dragged their feet, because they spoke out or simply because they were not liked, for whatever reason, by the man who wielded the ladle in the canteen. Countless people were killed indirectly through neglect, as local cadres were under pressure to focus on figures rather than on people, making sure they fulfilled the targets they were handed by the top planners. "A vision of promised abundance not only motivated one of the most deadly mass killings of human history, but also inflicted unprecedented damage on agriculture, trade, industry and transportation. Pots, pans and tools were thrown into backyard furnaces to increase the country's steel output, which was seen as one of the magic markers of progress. Livestock declined precipitously, not only because animals were slaughtered for the export market but also because they succumbed en masse to disease and hunger - despite extravagant schemes for giant piggeries that would bring meat to every table. Waste developed because raw resources and supplies were poorly allocated, and because factory bosses deliberately bent the rules to increase output. As everyone cut corners in the relentless pursuit of higher output, factories spewed out inferior goods that accumulated uncollected by railway sidings. Corruption seeped into the fabric of life, tainting everything from soy sauce to hydraulic dams. 'The transportation system creaked to a halt before collapsing altogether, unable to cope with the demands created by a command economy. Goods worth hundreds of millions of yuan accumulated in canteens, dormitories and even on the streets, a lot of the stock simply rotting or rusting away. It would have been difficult to design a more wasteful system, one in which grain was left uncollected by dusty roads in the countryside as people foraged for roots or ate mud." Mao seemed to go crazy in 1956. Pictures taken at that time show him contorting his face like a mad man and running around in a coolie hat. 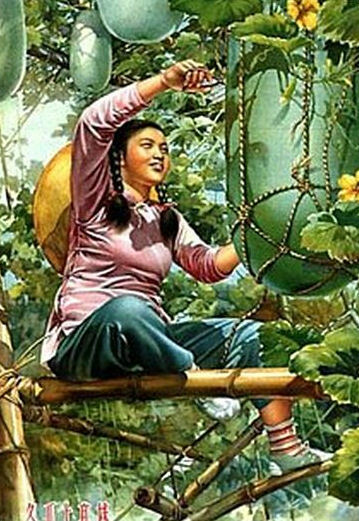 In 1957 he was influenced greatly by Lin Biao, and by 1958, he refused to swim in his own swimming pool, claiming it was poisoned, and traveled in hot weather in a train followed by two truckloads of watermelons. 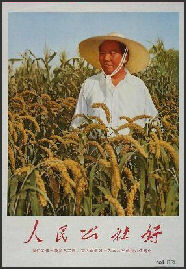 In this period Mao moved heavy industry, chemical and petroleum factories to locations in Western China, where he thought they would be less vulnerable to nuclear attack, and established people's communes, colossal communes made up of dozens of large agricultural cooperatives, that he claimed would "be the bridge linking socialism to communism." The historian Frank Dikötter wrote in History Today: “Mao thought that he could catapult his country past its competitors by herding villagers across the country into giant people’s communes. In pursuit of a utopian paradise, everything was collectivised. People had their work, homes, land, belongings and livelihoods taken from them. In collective canteens, food, distributed by the spoonful according to merit, became a weapon used to force people to follow the party’s every dictate. Mao Zedong’s "The Question of Agricultural Cooperation"
A party official later told Li that this entire train spectacle was "a huge, multi-act Chinese opera performed especially for Mao. Local party secretaries had ordered furnaces constructed everywhere along the railroad route, stretching for three miles on either side, and the women were dressed so colorfully because they had been told to do so." With no free press or political opposition to keep them in line, officials exaggerated figures and falsified records to meet the quotas. "We would just find out what they were claiming in another commune," one former cadre told the Los Angeles Times, “and add to that number...None dared give the real amount because you would be branded a counterrevolutionary." One famous picture in China Pictorial magazine showed a wheat field so thick with grain a boy was standing on the grain stalks (it was later revealed he was standing on a table). On farmer told the Los Angeles Times, "Everyone pretended we had big harvests and then went without food...We were all afraid to talk. Even when I was a little boy, I remember being afraid to tell the truth." ”The backyard steel furnaces were equally disastrous....Fires were fed with the peasant's wooden furniture. But what came out it was nothing more than melted-down implements." A year after the Great Leap Forward was launched, Li wrote, Mao learned the truth: "High-quality steel could be produced only in huge, modern factories using reliable fuel. But he did not close down the backyard furnaces for fear that this would dampen the enthusiasms of the masses." Meanwhile, since the Great Leap Forward mandated rapid industrialization, even peasants’ cooking implements were melted down in the hope of making steel in backyard furnaces, and families were forced into large communal kitchens. They were told that they could eat their fill. But when food ran short, no aid came from the state. Local party cadres held the rice ladles, a power they often abused, saving themselves and their families at the expense of others. Famished peasants had nowhere to turn. “And one wonders how some of the survival strategies developed sixty years ago during the famine have actually shaped the country as we know it today. Then, as now, party officials and factory managers learned how to exploit the system and cut corners in order to meet quotas imposed from above, churning out massive quantities of pirated, tainted, or shoddy products without any regard for the consequences on ordinary people. When, a few years ago, I read about hundreds of enslaved children working in brick kilns in Henan, kidnapped, beaten, underfed, and sometimes buried alive with the complicity of the police and local authorities, I really did start wondering about the extent to which the famine is still casting its long and dark shadow over the country. "China's economy is not what [Party leaders] claim as the 'socialist-market economy,' " Tombstone author Yang Jisheng told the Wall Street Journal. "It's a 'power-market' economy. It means the market is controlled by the power. . . . For example, the land: Any permit to enter any sector, to do any business has to be approved by the government. Even local government, down to the county level. So every county operates like an enterprise, a company. The party secretary of the county is the CEO, the president." That suggests China will never become a mature power until it becomes a democratic one. As to whether that will happen anytime soon, Mr. Yang seems doubtful: The one opinion widely shared by rulers and ruled alike in China is that without the Communist Party's leadership, "China will be thrown into chaos." Still, Mr. Yang hardly seems to have given up hope that he can play a role in raising his country's prospects. In particular, he's keen to reclaim two ideas at risk of being lost in today's China. The first is the meaning of rights. A saying attributed to the philosopher Lao Tzu, he says, has it that a ruler should fill the people's stomachs and empty their heads. The gambit of China's current rulers is that they can stay in power forever by applying that maxim. Mr. Yang hopes they're wrong. "People have more needs than just eating!" he insists. "In China, human rights means the right to survive, and I argue with these people. This is not human rights, it's animal rights. People have all sorts of needs. Spiritual needs, the need to be free, the freedoms." The second is the obligation of memory. China today is a country galloping into a century many people believe it will define, one way or the other. Yet the past, Mr. Yang insists, also has its claims. Great Leap Forward: the Greatest Mass Murder in History? Text Sources: Asia for Educators, Columbia University afe.easia.columbia.edu <|>; New York Times, Washington Post, Los Angeles Times, Times of London, National Geographic, The New Yorker, Time, Newsweek, Reuters, AP, Lonely Planet Guides, Compton’s Encyclopedia and various books and other publications.